Buy the Farm . . . Share: Newssaka, it's a Date! The latest salvo in the war against leftovers came tonight with a series of offensives that our leftovers may never recover from. I think that in the war against leftovers the most crippling blow yet has been delivered. 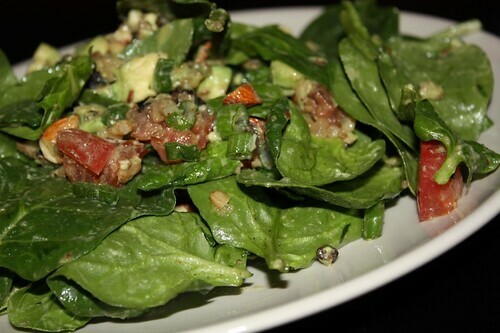 For a salad: spinach, almonds, tomato, avocado, currants, brown rice, and ground flax. I dressed it with nothing other than Bragg's Liquid Aminos. It's something I've had around for years but seldom used. Lately I've been using it a lot. It has zero calories, tons of flavor, and is a great dressing for a salad if you mix in a number of other ingredients as well. I don't want to be one of those people but Bragg's Liquid Aminos is a great thing to have in your fridge. For just a couple of bucks you can spray (or drizzle) this magical substance onto just about anything to make it taste better. The only downside is that I can't quite figure out what it is. I'm pretty sure I learned about amino acids in tenth grade biology class. I think they have something to do with mitochondria (which, incidentally, are the power house of the cell). I'm also pretty sure that all of that is wrong. It's been a while since tenth grade biology. For the main course I took an elderly eggplant which was winding down its life in the fridge and turned it into this dish. It's like a take on moussaka except that it's so loosely based on moussaka that it can barely qualify to have that monniker. This is something entirely new all together: newssaka. I browned some garlic and onion, tossed in some Jersey Fresh tomatoes (which, strangely enough, come in a can), basil, and ground beef from the freezer. 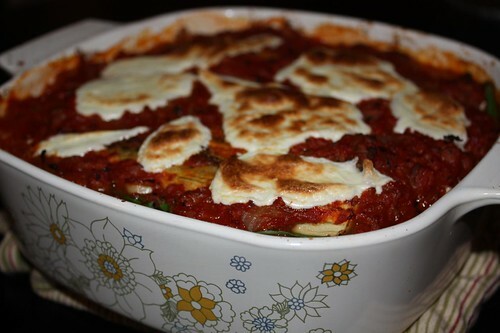 Then I layered it with the strips of roasted eggplant, mozzarella, spinach, and brown rice (why not?) to make this casserole. 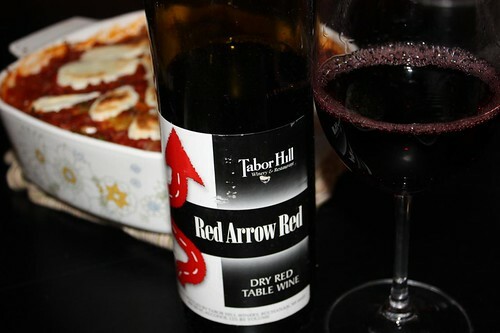 For wine we enjoyed some of the Tabor Hill Red Arrow Red that Jen's father had thoughtfully brought to us this past November. 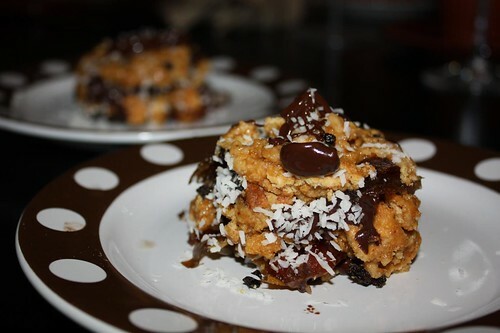 For dessert I crushed up some graham crackers with a little Lyle's Golden Syrup and layered it with Medjool dates, melted chocolate, and coconut flakes to make this dessert. I call it a "Chocolate Date Mound" partly because of its shape, partly because of its ingredient similarity to the popular candy bar. That freezer and those cupboards don't even know what hit them! We'll see the bottom of the freezer by midweek at this rate! Here's to keeping those grocery bills low! I keep meaning to pick up some Braggs, but they are on the same shelf at the store as the Annies Goddess salad dressing and I always get distracted by how delicious that stuff is and forget about the Braggs.